Crazy for a good cause. Michigan law enforcement traded their uniforms for costumes as they prepared for the polar plunge. The plunge benefits Special Olympics Michigan. “About half of it goes to the state office and helps with their expenses which cuts down on our expenses to go to events and the other half comes right back to our area for Van Buren, Berrien, and Cass counties to pay for our athletes to go to events,” Special Olympics Michigan Area 17 Director Timothy McDaniel said. After a little bit of liquid courage, everybody was ready to take the plunge. “Just gotta have a couple of beers and go for it,” Watermark Brewing Co. co-founder Chris Mason said. The pool was christened and the plunge officially began. Special Olympics athlete Korina Hacker was one of the judges. “I’m looking for people who jump and have fun!” Hacker said. Hacker was judging based on costumes and plunges. “It’s exciting to watch them all do it for money you know to raise money for it,” Hacker said. Lt. Dawson was also a judge and enjoyed staying warm while watching the show. 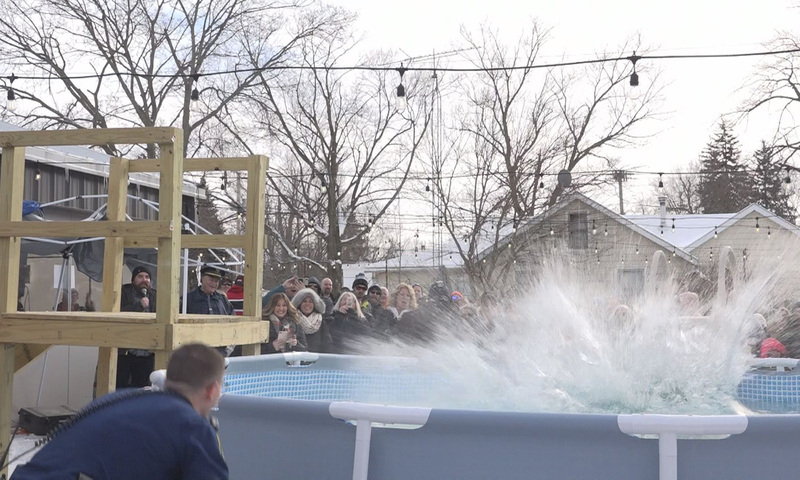 The plunge was held at Watermark Brewing Company. “Here at Watermark it’s really important for us to give back to our community,” Mason said. Saturday’s plunge nearly quadrupled previous donation totals, leading to more opportunities for those in Special Olympics.